mAh per display square in. 384mAh/sqrin. 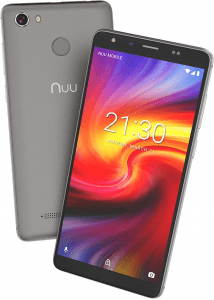 Also known as NUU G1, the G1 adopts the trendy (as of its release) 18:9 aspect ratio, making its 5.7-inch HD+ display sound more appealing than ones with old-fashioned 16:9 setups, while it lugs a colossal (by entry-level standards) 5000mAh battery cell, which promises up to 50 hours of calling time and a 160-hour audio playback time. It also runs on an Android Go Edition OS, which is specifically designed for budget smartphones with its kind of low-key hardware specs. Also known as NUU G1.